Even before 3G and 4G roll-outs, Pakistan's mobile data users enjoy an average bandwidth of 1.5 Mbits/sec and peak bandwidth of 14.7 Mbits/sec, according to a report published by Akamai Technologies, Inc. The Akamai data includes usage from smartphones, tablets, computers, and other devices that connect to the Internet through mobile network providers. The only mobile broadband option available to users in Pakistan has so far been PTCL's EVO. Akamai Technologies, the creator of this report, operates an Internet content delivery network headquartered in Cambridge, Massachusetts. Akamai's network is one of the world's largest distributed-computing platforms, responsible for serving between 15 and 30 percent of all web traffic around the world. 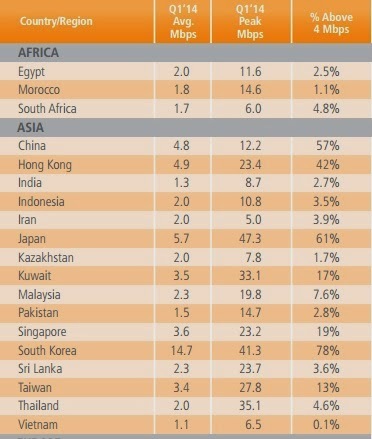 Akamai report ranks 16 countries in Asia by mobile Internet speeds. South Korea tops the list with average 14.7 Mbits/sec and 41.3 Mbits/sec peak. Vietnam is at the bottom with 1.1 Mbits/sec average and 6.5 Mbits/sec peak. India ranks second from bottom with 1.3 Mbps average and 8.7 Mbps peak. With 3G and 4G roll-outs currently underway in Pakistan by multiple carriers, companies like Zong are talking about delivering speeds of up to 42 Mbps while other companies are offering 3G speeds of up to 21 Mbps. Even if they fall short, I expect that the average mobile broadband speeds in Pakistan should still be lot faster than what's available in the country today. what is the average MBs downloaded /user? US 4G speeds on average are pretty low because Americans use MUCH more data per capita than most countries. I suspect Indians use more MBs than Pakistanis,in any case 1.3/1.5 not much of a difference. FWIW I have a 3G airtel plan HSDPA+ (theoretical 21 Mbps) practically it gives around 3Mbps. Anon:"I suspect Indians use more MBs than Pakistanis,in any case 1.3/1.5 not much of a difference"
India has been ranked the lowest in terms of average Internet speeds within Asia by a new study which has revealed the mean speed to be 1.7 Megabits per second (Mbps). The global average is 3.9Mbps which shows how far behind India is lagging in this department. From the Asia-Pacific region, a total of 14 countries were chosen for this Internet speed study, and India was eventually found to be at the last spot at the end of it. Another interesting bit that has come out is that India’s average peak connection speed is said to have declined by 1.5% in the first quarter of this year. We boast about the number of net users, which is actually HUGE, percentage wise..........BUT most of them are on 'Narrowband'. BMI View: Pakistan is ushering in the 3G era after awarding 3G licenses to operators Mobilink, Telenor Pakistan, Pakistan Telecommunication Mobile and China Mobile Pakistan in May 2014. BMI forecasts Pakistan's 3G penetration will reach 0.65% by the end of its first year in operation and grow to 8.7% by the end of 2018. Consumer purchasing power and limited 3G coverage are key downside risks to our forecast. Regulator Pakistan Telecommunication Authority (PTA) finally issued 3G concessions to operators Pakistan Mobile Communications' Mobilink, Norwegian telecom conglomerate Telenor, the Pakistan unit of China Mobile and Ufone of Pakistan Telecommunication Mobile in May, after delays dating back to 2012. China Mobile Pakistan, which offers services under the brand name Zong, also bid for 4G concessions. The fifth operator in the market - Warid Telecom - did not participate in the spectrum auction, although the operator has obtained permission from the PTA to launch 4G services on its existing 1,800MHz spectrum. BMI believes consumers are most likely to upgrade to 3G services, given the comparatively high cost of 4G technology and devices. BMI projects Pakistan's 3G subscriptions to rise from 1,200 at the end of 2014 to 17,285 by 2018. This represents 10.2% of Pakistan's mobile subscriber base. Our estimate is based on three factors: regional peers' comparison, GDP per capita and 3G network coverage. The growth rate is comparable with peer markets such as Cambodia, Laos, Vietnam and India, which share many of the same characteristics as Pakistan. Broadband subscribers base has reached 3.4 million at end of February this year as around 717,835 new users joined the platform during last eight months. An average annual growth rate of broadband is still above 100 percent in the sector. An official at Pakistan Telecommunication Authority (PTA) on Thursday said one subscription can cater broadband needs of a number of people in a house/business facility, therefore, broadband users are in larger numbers than the subscription. He said taking an average family size of four people, the broadband users, based on number of broadband subscriptions of 3.4 million are around 13 million. The official said this number is reasonably be higher than this as corporate subscription of broadband is also used by multiple users. He said with the introduction of 3G/4G mobile services, the mobile broadband penetration in the country would substantially increased in coming years. Congratulations, sir, for beating Bhindia. Once again. Mobile phone subscribers are 131 million in Pakistan out of 170 million. Pakistan is ninth in top ten mobile phone users with annual growth of 13.3%. The mobile penetration rate amongst urban class people is almost 100%. The recent award of 3G and 4G licenses to cellular service provider likely to be more deployment of the mobile technology. Mobile services in Pakistan started in the late nineties during Musharraf’s regime. The government policies driven by vast privatization, catalyzed revolutionary changes in telecommunication which triggered a complex pattern of social changes and economic growth. Today, the majority of people are connected to each other in everyday life. The cheap mobile phone from China are simple to use, brought vast network of communication in Pakistan from Himalayas to bay of Arabian shores. About 67% of the market is captured by cheap mobile phone, which cost less than $50. Imported American-made mobile phones are expensive, with incomprehensible built in features. 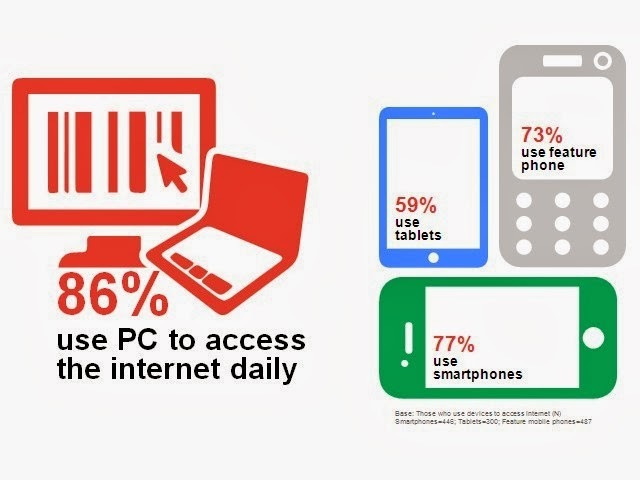 Did mobile phones makes life different to Pakistani people? Of course, it did. Acquiring a mobile phone propagates new individuality aroused by the new social order. Mobile communication is not about mobility but autonomy. It provides the owner the chance to be alone or with another person, at the same time to be in touch with people one might never see, across thousands of kilometer. People live in a networked individualism, connected to host of people all over the world. At the same time, those people ignore their own physical next door neighbors. However, Pakistan’s decisions to adopt new standards of the globalized world, entangled people to spun web that has become most tempting. Diverse homogenized customs practices are slowly dissolving into national or international norms. Poverty and lack of information are mutually interrelated. Deployment of mobile phone have a multi-dimensional positive impact on sustainable poverty reduction. It has raised positive aspects as the level of education, economic efficiency, social services, health, sense of security and effects on family and social cohesion. The mobile phone is blessing in a busy life to keep in touch with family and friends while distances are huge, save time, and reduce traveling. Mobile phones are not mere luxuries tool but rather essential tool that have improved earning capacity of farmers, fisher folk, rickshaw driver, street hawker, sweeper and doobis. Mobile phone is source of employment in creating jobs for vendors, security guard, engineers, franchise offices, and executives. Many of the occupation require mobile devices, such as repairman, technicians, electricians, sales people, builders, realtors, and airline or train-bus reservations offices. Microsoft offers a dozen smart phone applications for the medical people to diagnose patients from distance. It enables healthcare workers to transfer data to specialist in distance centers. Mobile devices deepen the changes that an average citizen can informally communicate with a high ranking politicians or journalists on twitter, – or email to express his or her point of view. It has become a practical way a government interact with its citizens or offers a greater potential to connect people regularly to state institutions. It is new form of bottom up expression of freedom in a Pakistan. Pakistan is going to be the best in the SA. Riaz Haq, with these kind of internet speed, the government is becoming a role model for SA and I appreciate your efforts in making it obvious for your readers. Usman: "the government is becoming a role model for SA and I appreciate your efforts in making it obvious for your readers." It would be wrong to give credit to PMLN govt for these results because these speeds are based on EVO which has been there for several years. The impact of 3G and 4G will become apparent in the next few years. Less money moves through wireless transfers in India than in either Pakistan or Bangladesh, both of which have smaller populations. That doesn’t mean there isn’t opportunity. India has 15 mobile money providers, second only to Nigeria. Of the 904 million mobile subscriptions in India, 371 million (pdf) are in rural areas. Analysts think that mobile money transfers in India could be worth $350 billion annually (paywall) by next year. Yet the state of the industry remains small: Less money moves through wireless transfers in India than in either Pakistan or Bangladesh, both of which have smaller, poorer populations. So why, despite boasting 15 mobile money services, does India lag so far behind other developing nations? The simple answer is regulation. India requires mobile operators to work with banks to provide the services. Mobile networks would like instead to have their own agents who can cash out the digital money into hard currency. Much of the infrastructure is already in place, because there are so many locations where customers can top up on airtime. But the mobile operators aren’t allowed to use those sales outlets as financial agents. Yet the banks aren’t filling the gap. They have failed to serve rural areas, especially thinly-populated ones. Nor are they particularly keen on sending agents to operate in small villages. A report (pdf, p.31) on financial services for the poor, commissioned by the Reserve Bank of India, called the situation in both rural and urban India “grim,” with 64% of Indians lacking bank accounts. “The business case for providing mobile money services to the unbanked in the most remote rural areas of India is not appealing to banks,” reports the GSM Association (pdf), a trade body of mobile operators. Mobile subscribers made up 73.6% of Pakistan pop at the end of 2013. As of May the figure has increased to 76.2%, according to Pakistan Telecom Authority. According to a research by Nokia, the global leader in mobile broadband technology and solutions, Pakistan presents huge growth opportunity for telecom infrastructure and solution providers given the three major push factors - a large population of 179.2 million, increasing use of mobile services by its people and the relatively early phase of its 3G rollouts. Although Pakistan was ranked 25th out of 26 countries in the developing markets, based on the 'Connectivity Scorecard' which measures useful connectivity, Pakistan is ready for the next big growth in its 3G and data networks, in line with the growth in the use of data worldwide and the increasing appetite for online content among its people. The research results, which were shared recently at Nokia’s “Connected Pakistan – 3G, 4G Perspectives” conference in Islamabad also indicate that infrastructure is specifically the most critical area in pushing Pakistan's telecommunications sector forward, especially its nationwide 3G deployments. In its statement, Nokia cites figures from Ovum, a market research company which says that 3G subscriptions in Pakistan will overtake 2G subscriptions by 2019, and there will be 103.4 million 3G subscriptions in Pakistan by then, making up about 58% of the mobile market. Ovum also forecasts that the adoption of 4G will be more modest than for 3G for the foreseeable future, with the number of LTE subscriptions in Pakistan reaching about 6.6 million by the end of 2019. Zong will invest $1 billion in the next three to four years to deploy network for Next Generation Technologies including 3G/4G in maximum cities of the country in line with it business plans and continuity of the long-term friendship between China and Pakistan. This was stated by Fan Yunjun, CEO Zong while official launch of 4G technology in Karachi with the roll out of new service in seven different cities of the country . The company plans are aggressive for 3G, 4G and even 2G and it will add 4,000 new high-tech sites by the end of 2014. Zong is the first network of 4G technology that will bring the country a pride as Pakistan will become first in the index of highest broadband service from 93rd position from the present. It even left China in the race which is stand at 4th position on the scorecard. Chinese operator is providing 3G service with a broadband speed of 42 Mbps and 4G LTE with 150 Mbps. Zong is the biggest cellular operator in terms of 3G technology user base with nearly 866,000, Yunjun claimed. Zong is the choice of 47 percent of the subscribers using 3G technology among different operators who are also providing same service in the country, he claimed quoting an independent third party research. He said the availability of the low cost smartphone is hampering the growth of 3G and 4G technologies but the company is working with different handset manufacturers to introduce those gadgets which could be affordable to maximum people in the country. Zong is working to develop an ecosystem which helps promoting technology and its impacts on the lives and business of the people, hence different new ventures will be taking place within different companies to introduce various apps to subscribers in future. Yunjun added that Zong 4G enabled SIM is highly secure, speedy and data capacity of 46KB whereas facilitating customers, a handset M811 handset is the first step to provide the customers with a complete bouquet of hardware and service provision. Chinese operator is the fastest growing network in terms of subscribers as it acquired more than 50 percent connections among the overall base in the past three years reaching the overall numbers at 27.2 million at present. The combination of 3G/4G technology along with 2G will add more number of customers in the future though Next Generation Technologies are made available in 19 cities. Thursday, October 23, 2014 - Karachi—Mobilink 3G customers have reached 1 million mark rendering it as the fasted growing 3G service in Pakistan. Mobilink hit the 1 million mark within 90 days of commercial launch, which is the fastest uptake of 3G services of any cellular operator in Pakistan. Mobilink’s 3G services were launched in July this year and continue to provide high-speed Internet to customers in 12 cities of Pakistan and counting. The evolution of Mobilink’s 3G network is a result of carefully designed roll-out plan that makes the best use of 10MHz spectrum while focusing on excellence in customers’ experience. Bilal Munir Sheikh, Chief Commercial Officer Mobilink commenting on the success said; “Reaching the 1 million mark is only the beginning of a delightful journey for our customers and manifestation of our strategic approach towards building an ecosystem of high-speed internet in Pakistan. Earlier this year, following the auction of 3G license Mobilink was the only operator to empower customers with free 3G services as a means to celebrate its 20 years of operations in Pakistan as well as increase awareness about high-speed internet. This gesture was much welcomed by customers as it enabled them to try out Mobilink’s high-speed mobile internet services free of charge for a period of 2 months. Mobilink continues to grow its footprint across Pakistan through systematic rollout of 3G services across major cities of Pakistan. The number of 3G subscribers has touched around 4 million mark, apparently surpassing all other broadband technologies in the country. There are around 3.7 million broadband users in Pakistan as per official data for all technologies combined including WiMAX, DSL, EvDO, FTTH, Satellite, HFC and others till May this year. Three mobile phone operators have already announced that each of them has crossed 1 million mark of 3G subscribers while Pakistan Telecommunication Authority (PTA) is yet to formally release the stats about 3G and 4G subscribers. According to Mobilink, it has 1 million 3G users on October 22, Telenor has 1.3 million 3G users on October 28 while Zong has also announced that it has 1 million 3G users. Ufone has not said a word so far about its subscribers. Based on operators' announcements, there are at least around 4 million 3G users as of today. With these figures, one can ascertain that 3G subscribers have crossed the numbers for all other broadband technologies, that too within just six months of auction of 3G and 4G licenses. Pakistan is a vibrant, rich society full of potential and the means to realize it. It is much more than what the headlines in the Western media often convey. Despite its challenges, and all investments are challenging, it is a haven for foreign investment. The success of our company, Telenor Pakistan, testifies to this reality. Telenor is Norwegian and operates across Europe and Asia as one of the world’s leading telecom and digital service providers. And Telenor Pakistan is very much a Pakistani success story. In March, we will mark a decade since our launch in the market here. When we started, we were the sixth entrant in the telecom sector. Today, with 36 million GSM customers alone, we now vie for leadership in a highly competitive sector. We are bullish about Pakistan and our commitment to it is profound. We are in the process of building our new head office here with an investment of $70 million. We have, so far, invested $2.2 billion in Pakistan, and we expect our investment in the coming years to be of the same order of magnitude. We have just invested in a new 3G license and are deploying 3G sites around the country in both urban and rural areas every month. The spectrum auction conducted this year was executed with the highest level of professionalism and transparency, conditions that allowed participants to make bids with the greatest confidence in the process. Pakistan’s progressive approach to telecom is publicly recognized: on Oct. 27, Pakistan was elected to the ITU Council, the telecom industry’s global governing body. The country has a deep pool of talent in all disciplines. The universities deliver great people to our doorstep year after year. Of the 2,800 or so direct employees of Telenor Pakistan, 2,798 are Pakistani nationals. We export more of our talent to the Telenor Group than any other business unit in our worldwide family of companies. This place is a goldmine of winners with an overwhelming desire for personal achievement and, in our company, a desire to build an empowered Pakistan. Pakistan’s telecom sector is taking the lead in ensuring financial inclusion, an essential driver of economic growth and international competiveness, can be attained. We are contributing to the formalization of the economy through EasyPaisa, an award-winning suite of services in partnership with Tameer Microfinance Bank Limited. We transit close to Rs. 500 billion every year through EasyPaisa, which has a customer base of over 6 million. EasyPaisa is growing every day, thanks in no small part to the State Bank of Pakistan, a visionary financial services regulator and growth catalyst. The data business is still essentially nascent. Our growth has been enabled by the dynamic regulatory environment that Pakistan offers foreign investors. We have been able to actively pursue our vision of empowering societies through our GSM and financial services with the assistance of the progressive, business-friendly policies of successive governments. Our journey in Pakistan has been rewarding but not without its difficulties. The telecom sector’s success has been made possible because our voice, and the voice of the industry, is heard by the government, the regulators and state agencies when we discuss ways to evolve economic, industrial, fiscal, and taxation policies. We have always found open doors to address grievances and to find ways and means to increase our impact on society and the economy. We have found in Pakistan not just a thriving market but a home that rewards our industry and recognizes and embraces foreign investment as critical to fulfilling the country’s economic aspirations. As an investor, you couldn’t ask for more. Foley is president and CEO of Telenor Pakistan. From our Nov. 1-15, 2014, issue. ISLAMABAD: Telecommunication service provider Ufone has unveiled the launch of iPhone 6 and iPhone 6 Plus in Pakistan in collaboration with Apple. The popular smart phones will be made available to consumers under the banner of the telecom service provider from Dec 11 this year. Customers will be able to register online for iPhone 6 and iPhone 6 Plus from Nov 28 at the company’s website, a press statement said. This is the first time that Apple has collaborated with a Pakistani telecommunication provider for the launch of its signature smart phone. Apple is considered one of the biggest names in technology-related products and is widely believed to be the world’s second-largest information technology company. Despite the phone’s official unavailability in the country, iPhone enjoys a large fan base in Pakistan, with many users already awaiting the entry of the new product. The prices are bit expensive then the local market starting from Rs80,000 – Rs115000. iPhone 6 was first officially introduced two months ago in the United States. 3G-4G rollout and growth of smartphones helped increase access to Internet as subscribers signed up at a rate of a million a month to hit the 5 million mark in 5 months since the launch. High-tech startup ecosystem took shape with several successful startups in e-commerce, smartphone apps space, gaming, etc. Several VC deals closed. A dozen e-commerce startups are starting to take off in Pakistan. KARACHI: The country’s telecommunication revenue increased to Rs90 billion during fiscal year 2014, reflecting growth of 24.6 per cent, which is more than double of 11.66 per cent of FY2013. According to Pakistan Telecommunication Authority, the cellular sector covered more than half of the telecom sector’s overall revenues and reached Rs47 billion during the year under review, translating to a year-on-year growth of 47.4%. As of June 30, 2014 data revenues account for 19.3% of the telecom sector’s overall revenue, up from 16.4% at the end of FY13 – the number for cellular segment, too, increased from 7.3% to 10.1%. According to PTA, the data revenue trend is likely to continue in the coming years with increased use of smart phones, tablets and laptops in the consumer market and an uptake of OTT services, such as WhatsApp, Viber and Facebook messenger, which will eventually replace traditional voice communication. Import of mobile phones showed record growth in FY14 as handsets worth $544 million were imported during the period, a 21% year-on-year increase. Although voice traffic continued to show impressive growth (40%) in FY2014, conventional text messages – one of the main revenue streams for cellular mobile segment – struggled against the more popular social media applications. The total number of SMS exchanged over the cellular mobile networks dropped to 301.7 billion during FY2014, down 4% compared to 315.7 billion last year, statistics showed. The average SMS per cellular subscriber per month also reduced to 180 in FY14 compared to 214 of FY13. The telecom regulator attributed the decline in conventional text based messages to the rising influx of smart phones and use of mobile internet, OTT and social media applications that have reduced the subscribers’ dependence on traditional mode of SMS. Though these OTT services have triggered the growth of CMOs’ data revenues, free messaging and calling services also dented the sector’s average revenue per user (ARPU), a key economic indicator to measure the average revenue that service providers generate from a singlesubscriber. In FY14, the cellular segment’s monthly ARPU decreased to Rs199 compared to Rs211 of the last fiscal year, according to statistics compiled by PTA. The regulator, however, clarified that the ARPU was calculated based on the number of SIMs sold till that time and the actual ARPU was higher. Quoting a GSMA’s market analysis on Pakistan, the regulator said the cellular subscribers in the country possess 2.17 SIMs on average, which translates to an actual monthly ARPU of approximately Rs432. As of Gregorian calendar month thirty, 2014 information revenues account for nineteen.3% of the telecommunication sector’s overall revenue, up from 16.4% at the tip of FY13 – the amount for cellular section, too, exaggerated from seven.3% to 10.1%. According to PTA, the information revenue trend is probably going to continue within the coming back years with exaggerated use of sensible phones, tablets ANd laptops within the client market and an uptake of OTT services, like WhatsApp, Viber and Facebook traveller, which is able to eventually replace ancient speech communication. Import of mobile phones showed record growth in FY14 as handsets value $544 million were foreign throughout the amount, a twenty first year-on-year increase. A satellite broadband service of the UAE-based Al Yah Satellite Communications Company (Yahsat), YahClick, has officially launched services in Pakistan. “Customers across Pakistan will now be able to connect to a satellite broadband via a small dish and modem, without the frustration of congested networks,” Yahsat said in a statement. The statement added customers can connect to the satellite anywhere in the country, including places where terrestrial infrastructure is currently not available. “Our consumer launch in Pakistan is a significant milestone for YahClick. Regulatory approval by the Pakistani authorities for consumer use, paves the way for us to continue our global growth strategy in this promising market,” Yahsat CEO, Masood M Sharif Mahmood, said. Satellite technology is being used by YahClick to send and receive high-speed broadband internet signals in Pakistan linking some of the country’s most important infrastructure, including over 154 ATMs for many banks, and supporting election offices in remote areas and also connecting 1,600 students. “YahClick will help Pakistan accelerate its economic growth and social development by improving access to information and reducing operational costs for internet access in the most remote and currently underserved areas,” Mahmood added. Almost 34,000 subscribers have been acquired by YahClick for its satellite broadband service, up till now. Across 13 countries out of its 28 country footprint, the service has been installed of which seven are in sub-Saharan Africa. n Wednesday, a New York-based wireless coverage mapping company -- OpenSignal reported that India ranks 15 in terms of 4G network availability out of some 75 odd countries. And that's with no doubt is because of the buzz that Reliance Jio created with unlimited data and free calls, some reports claimed. But, even after that, India still stands at the 74th position out of 75 countries in 4G download speed. The report comes from OpenSignal again. OpenSignal releases a report of 75 countries with the most to least 4G download speed. And, to our surprise India stands at 74. Which shouldn't be the case after all the buzz that Jio created. Where is the Jio effect now? However, taking a closer look at the report, it highlighted that our neighbouring countries like Pakistan and Sri Lanka has almost two times more 4G download speed when compared to India. Singapore tops the list with 45.62 Mbps 4G download speed, while it ends with Costa Rica which could manage a 4G download speed of only 5.14 Mbps, similar is the case for India as well. This is pretty much apparent, as even today, when a minister was seen climbing a tree to get better mobile signal. What else can we even expect? With such a situation, Modi's dream to make India go digital seems a distant dream at the moment. After Jio was introduced back in September 2016, India witnessed a major telecom war, with other competitive telecom operators coming up with value for money tariff plans, offering free calls, unlimited data and so much more. This was all because of the Jio effect. The new OpenSignal report shows India with 5.14 Mbps 4G download speed, while Singapore that tops the list has a download speed of 45.62 Mbps, almost 9 times more than India. While on the other hand, the neighbouring countries like Pakistan is said to have a 4G download speed of 11.71 Mbps and Sri Lanka also managed to have a download speed of 10.42Mbps.